One of the things most closely associated with the image of Mark Twain is smoking. Twain lived in an era when tobacco use was far more acceptable than it is today, and there were many methods involved in the use of it. Snuff, a powdered tobacco that’s either inhaled in tiny quantities, or rubbed on the gum, was acceptable enough for a proper lady like the Widow Douglas, but in the 19th century smoking was only acceptable for men. Though the habit was considered dirty by some, it was acceptable as long as men limited it to particular times and circumstances. Trains had smoking cars, large homes had smoking rooms, and wealthy men could smoke at their clubs. Tobacco came in five main forms. We have already seen snuff. Closely related to snuff was chewing tobacco, which came in long, round sections, something like very thick rope. A man would cut a small section, usually called a “chaw.” The cigar dated back to Native Americans who had rolled tobacco into long cylinders for centuries. During Twain’s lifetime, the cigarette—a kind of mini-cigar wrapped in thin paper—became popular. But throughout the 19th century the most prevalent method of tobacco use was smoking it in a pipe. If pictures are any indication, the pipe was Twain’s favorite. In most photos and drawings he has one in either his hand or his mouth. Twain had all kinds of pipes, and, like most smokers, he switched from one to another. He had briar pipes, cherry pipes, and meerschaum. Meerschaum is a porous rock-like material found in large deposits in Turkey and its neighbors. A meerschaum pipe will start out white, but as it is smoked the outer bowl and stem gradually take on a yellow-brownish coloring. If the smoker holds the meerschaum in his fingers as he smokes, the white material absorbs oils from the skin, resulting in a pipe of many colors. 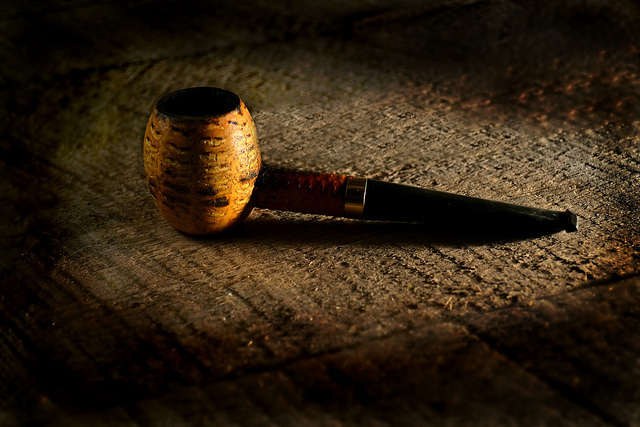 The pipe is fragile, expensive, and highly prized by most pipe smokers. Twain’s smoking habits—like the man—reflected two sides: There was writer-humorist, Mark Twain (his pen name), and respectable Hartford businessman, Samuel Langhorne Clemens. His choice of a pipe could symbolize either calm authority, sophisticated wit, or hayseed humor. When Twain smoked a meerschaum pipe that showed off the middle class respectability he seemed to crave in his Samuel Langhorne Clemens persona. His huge, odd-looking calabash went better with smart comedy and sophisticated satire. His lowly corncob was the favorite of his writing persona: Mark Twain, former riverboat pilot, and now a teller of tall tales around the camp fire. 1 The Portable Mark Twain, edited by Bernard DeVoto, Viking Press, 1946. 8 “Huckleberry Finn.” By Mark Twain. Search E-text, Read Online, Study, and Discuss. N.p., n.d. Web, accessed 12/11/15. Instructor comments: This class met entirely at the Mark Twain House & Museum and the Harriet Beecher Stowe Center and therefore gave us an opportunity to read the literature of these authors in depth and also to study the material evidence of their lives in the homes, archives, and exhibits. The challenge for me as a professor of literature was to devise a research assignment that would bring these two experiences together. The challenge for the students was to try to meet the crazy demands of my assignment! Sasha rose to the occasion. Her idea started with a corn-cob pipe in an exhibit and blossomed into an informative and creative essay on the significance of pipe-smoking in the life of Samuel Clemens and in the works of his literary alter-ego, Mark Twain. Photo credit: “Corn Cob Pipe” by Tanya. Licensed through Creative Commons.